When Captain Toad featured in Super Mario 3D World, the general public unanimously bellowed to the heavens “Captain Toad needs his own game!” and lo and behold, here it is! It may have been a somewhat low key release on the now 10 feet under Wii U but that hasn’t stopped Nintendo’s underdog from waddling over to both the Nintendo Switch and, more surprisingly, the Nintendo 3DS. Captain Toad: Treasure Tracker was a rather spectacular looking game on the Wii U, it took the beautiful aesthetic of 3D World but squeezed out a little more detail with smaller, less demanding environments. An easy fit for Switch by all means but the 3DS transition clearly needed a lot more work. 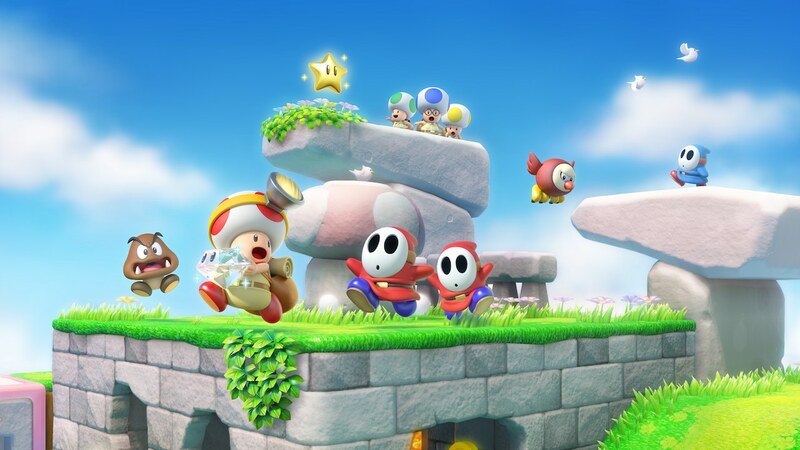 As a result, Captain Toad: Treasure Tracker bears a striking resemblance to 2011’s Super Mario 3D Land with lower quality assets and a halved frame rate but this is still very much the same Captain Toad! Funnily enough, the clear pipes have all been replaced with standard opaque ones. I suppose they’re nothing more than a pipe dream now. Those who played the Wii U original will know that there’s more than just a graphical hurdle to overcome but rather one of functionality. Captain Toad: Treasure Tracker was one of the few Wii U games to make proper use of the hulking Wii U GamePad and the result was a game that took incredible advantage of its simple mechanics. All Captain Toad can do is walk around and pluck plants but the lengths the game goes to expand upon these limited functions is nothing short of inspiring and a large element of that comes down to the ability to manipulate the levels themselves. The 3DS thankfully comes with what’s essentially a GamePad of its own on the bottom screen. Of course, the game would lose a lot of visual fidelity if the entire game took place on the small 4:3 screen but impressively Captain Toad: Treasure Tracker actually renders on both displays at once. What this means is you’ll be able to comfortably enjoy the game when gazing up at the top screen while simultaneously maintaining every single aspect of the Gamepads functionality on the bottom screen. You can still rotate levels, blow on propellers and hold enemies in place and out of all the Wii U games to make their way to 3DS, Captain Toad: Treasure Tracker is perhaps the one with the fewest sacrifices. It even benefits from being on 3DS with every single level playing out in stereoscopic 3D. If you found 3D Land’s bonus rooms impressive then prepare for what’s essentially an entire game of them. Simply put, Captain Toad: Treasure Tracker might just be the best looking game on 3DS in terms of pure art, technical prowess and impressive use of 3D. It’s unfortunate that the sound quality suffers as a result, the music holds up fairly well but sound effects can often feel like they’re pulled straight from a Nintendo DS game. Outside of somehow getting Captain Toad: Treasure Tracker to function on 3DS, not a great deal has changed since its Wii U debut. This is still one of the most charming puzzle games you can stumble upon and it even comes with a few small quality of life improvements to make everything just a little more manageable. The Wii U version only allowed you to view the levels from up high in the sky or up close and personal – neither of which was quite ideal for sections that required precision. To our delight, the new ports include one more zoom function that slots snuggly inbetween the prior ones. This is especially helpful as the default zoom wasn’t always ideal on my standard size New 3DS. You also no longer have to put up with the forced gyro controls of the Wii U version. Now I’m by all means an advocate for gyro, however, its implementation did very little to benefit Captain Toad: Treasure Tracker, this is a slow paced game that doesn’t need erratic camera movements. The option’s still hidden in the menus but it’s toggled off by default. While I see this as an improvement, it’s a shame that there’s no separate option to utilise gyro during sections that require aiming. Throwing turnips with just the Circle Pad can feel a tad clunky as this was clearly made with the motion controls of Wii U in mind. I would find myself turning gyro on and off on a per-level basis which can get a tad grating. It really is thrilling to play Captain Toad: Treasure Tracker once again, it can’t be understated just how intelligent of a puzzle game this is and not a single level feels the same as last. One has Captain Toad duplicate himself with a double cherry resulting in the two Toads teaming up together to build a path forward, another sees Captain Toad on the set of a moving train occupied with hostile Shy Guy and other times you’ll be escaping the clutches of a fire-breathing dragon. Captain Toad: Treasure Tracker is rich in variety and with each level hiding three gems and featuring a specific optional challenge, there’s a ton of reasons to dive back in when all is said and done. Jarringly, however, the 3D World stages from the original Captain Toad: Treasure Tracker have been replaced with brand new locales themed around Super Mario Odyssey, perhaps the 3D World levels were a tad too ambitious for the 3DS hardware. Regardless of their absence, the brand new zones are merely decent inclusions. It’s great to see New Donk City, Cascade Kingdom, Luncheon Kingdom and the Sand Kingdom in the style of Captain Toad but don’t let this be your reason for double dipping. The levels barely last five minutes apiece and I can’t say any rank too high on my list of favourite Captain Toad levels. With this being our third review of Captain Toad: Treasure Tracker, we’re running out of ways to praise this fantastic little puzzle game! It’s easily one of Nintendo’s most polished spinoffs to date and the fact that they’ve brought it over to 3DS with so few compromises is something to be commended. One may even argue that in terms of pure functionality, the 3DS port is more loyal than even the Switch with its built-in dual screens and microphone support. Whichever platform you decide to play it on, rest easy knowing that not a single one is lesser than the others.